1.1. This game event will take place from 14 October at 23:00 UTC to 24 October at 23:00 UTC on the Global Map. 1.2. All Clans will be able to take part in the event - both existing and newly created. All event battles will be held using Tier VIII tanks. Battles will be held in the 10 vs 10 format. Battle duration is 15 minutes. During the event, all Provinces are landing. Number of possible teams in landing tournaments is 64. There is an opportunity to participate in landing tournaments, having captured Provinces on event Front. All Provinces income is set to 600per day. The possibility of upgrading the Provinces on the event Front is disabled. The event will take place on the basis of successive tasks, that will be issued to each Clan individually. Current task information, their progress and awards will be available on the Global Map interface. A special Front will be available - an autonomous territorial unit with its own Prime Time from 18:00 UTC - 20:00 UTC, inclusive. Number of Provinces - 600. 2.1.1. When you open the Map you will be asked to choose a reference Prime Time when your Clan will operate. Only the Clan Commander, Executive Officer, Personnel Officer and Combat Officer can do this and start the quest. 2.1.2. After a Prime Time has been selected, a Clan will be sent to a Front that corresponds to the selected Prime Time. The Clan will then be randomly assigned a Landing Province, which constitutes the first task Landing. 2.1.3. As the Prime Time will have been confirmed by an authorised Clan representative, it is considered to be the start time for the Landing task too. The amount of time a Clan has to complete Landing is limited until the end of the nearest Prime Time. 2.1.4. If a Clan has not chosen a reference Prime Time and made a landing on one of the Provinces of the event Front, the prime time of the Province will be considered as the reference Prime Time for the Clan. Later on, the Clan will be able to change its reference Prime Time. 2.1.5. The Landing task counts as completed if the Clan wins the Landing Tournament and owns the Province. Capturing the Province will count even without placing a Headquarters on it. 2.1.6. The Landing task will be considered failed if, after Prime Time ends, the target Province is not owned by the Clan. 2.1.7. If a Clan fails the Landing task, a new first-stage task will be given after the end of the first Prime Time on the target Province. 2.1.8. A Clan can change its reference Prime Time, if it has no active "Capture" or "Defence" task. 2.1.9. To complete a "Landing" task, Clans must meet the requirements mentioned in the Landing on the map - Tournaments paragraph of the Global Map info page. 2.2.1. If a Clan completed the "Landing" task and captured the Province on the map, it will get the next task - Capture - to capture a Province that is selected randomly from among neighbouring Provinces. The Target Province for this quest should be selected within one hour of the reference Prime Time. If all bnordering provinces are under a clan's control, the target province for the next stage will be picked randomly from the amount of reference prime-time provinces. The Province will be considered as captured after control goes to the attacker's Clan. There is no need to place a Headquarters to capture the Province. For Capture tasks, Clans have until the end of the nearest Prime Time. 2.2.2. This task is considered as failed if a Clan does not capture the Target Province before the end of the nearest Prime Time. 2.2.3. After failing the Capture task, the Clan is immediately issued with a new Landing task. 2.2.4. Simultaneously with the Capture task, a Clan gets a Defence task - protecting the Province. 2.2.5. The Defence task will be considered failed if, at the end of the nearest Prime Time, the Province no longer belongs to the Clan. 2.2.6. Each step in the Capture task increases the rewards received by the Clan for both "Capture" and "Defence." In case of failure during a Capture task, the progress will be reset to its original value. 2.2.7. Defence task progress depends on Capture task progress. Only by performing Capture tasks is it possible to increase the reward for performing Defence tasks. 2.2.8. If a Clan has an active Defence task, but the Clan was knocked from the map, it is still possible to take part in the defence as long as there is still time to re-capture the Province in a Landing Tournament before the task expires. 2.3.1. Clan Fame Points can be earned not only by performing the aforementioned main tasks, but by preventing other Clans from completing their own. 2.3.2. If a Clan interferes in the progress of other Clans’ tasks e.g. by capturing a targeted Province, the Clan then receives 10% of the Clan Fame points, that the Clan/Clans which performs the "Capture" or "Defence" tasks chain in the battle for the target Province would receive. 2.3.3. Information on potential rewards for each Province will be available on the Global Map Interface. For example, if a Clan interferes in the progress of two Clans, the reward will be added together and will be 10% of the Fame points which could be earned by both opponent Clans. Both Clan and Personal Fame Point standings will be separate on every Front. If a Clan participates in battles on both Fronts, the Clan will get bonuses for each. 3.1.2. The number of Fame Points for performing Capture" and "Defence tasks is calculated with respect to the Capture task step - the number of successfully completed tasks in a row. 3.1.3. At the end of each battle, Clan Fame Points will be awarded in an equal amount to each Clan player who participated in the battle. All multiplying coefficients during the event are shown in the table below. The total number of Fame Points is calculated after applying all the coefficients. 4.1. In the Operation Safari event a penalties system will operate. This has been introduced in order to counter absenteeism. The system operates automatically and reacts to the information at the end of each battle. 4.2. If a Clan with a division on a territory doesn't go into battle or enters with a team consisting of fewer than 8 players, penalties will be applied. 4.3. The penalties system will be progressive - the more violations a Clan makes, the higher the penalties applied. 4.4. After the first three violations a Clan will be sent a warning. After three of these warnings, the system of penalties will be activated to apply to the Clan after each subsequent violation. 4.5. The system is configured in such way that it selects a level of punishment on the basis of information about violations in the last 7 days. 10% Fame Points fine on a Clan’s overall earnings at that moment. 50% landing tournament application fine on this event’s Front. 30% Clan Influence points fine. 100% landing tournament application fine on this event’s Front. If a Clan made its first offence four days ago and then made another, the system evaluating the amount of violations in the past seven days will apply the sanctions referred to in paragraph "2" of the table above. 4.8. If two Clans do not enter a battle, the system will consider both Clans to have committed an offence. Fake battles/result fixes are also considered a rules violation and will be punished with full Clan and Personal Fame Points withdrawal and game account suspension. In disputed situations of crediting Fame points (suspected match fixing etc) the game administration retains the right to request a battle record, screenshots and other information relating to this situation. If the requested information is not provided, the administration reserves the right to impose sanctions on the potential offenders. We strongly recommend you to turn on the option of "Record battles" (battle replays) in the Settings menu. The main prizes of Operation Safari will be 1000x FCM 50 t Tier VIII French heavy tanks and 9000x T23E3, Tier VII, US medium tanks which will be awarded in licenses given out to the top 70 clans by Fame Points earned. In addition, the Wildcard system will see any left-over licenses for FCM 50 t tanks, given to players who ranked highly in personal Fame Points earned. 5.1.1. The top 70 Clans at the end of the event will be awarded with licenses for T23E3 and FCM 50 t tanks. Tank licenses will be distributed depending on the position in overall Clans standings of the Front. 5.1.2. Only one tank can be awarded per player. 5.1.3. You must have played at least 5 battles for a Clan during the event to be eligible to receive a license. 5.1.4. Left-over tanks after Clans have been given their licenses will be distributed among players in the personal standings according to the Wildcard system. 5.1.5. Clans who scored same amount of Fame points will receive the same number of licenses. For such Clans licences will be credited in the same amount as players, mentioned in point 5.1.3 of the Regulation. 5.1.6. Any other left-over tank licenses will be distributed among players who placed the highest in the Hall of Fame. 5.1.7. These distributions will be made only after crediting Clan licenses and Wildcard tanks. 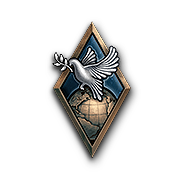 Peacekeeper Awarded to players who participated in five or more battles on the Global Map during the Operation Safari event. Tactical Master I Class Awarded to players who won more than 80% of their battles in Operation Safari and participated in at least 20 battles. Tactical Master II Class Awarded to players who won more than 70% of their battles in Operation Safari and participated in at least 20 battles. Tactical Master III Class Awarded to players who won more than 60% of their battles in Operation Safari and participated in at least 20 battles. 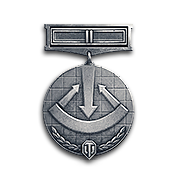 Tactical Master IV Class Awarded to players who won more than 50% of their battles in Operation Safari and participated in at least 20 battles. 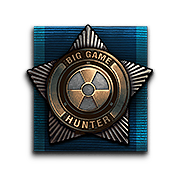 Big Game Hunter I Class Awarded to players of a Clan, that achieved 1st place in Operation Safari event. 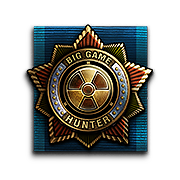 Big Game Hunter II Class Awarded to players of a Clan, that achieved 2nd place in Operation Safari event. 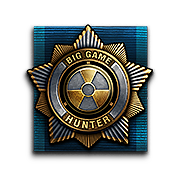 Big Game Hunter III Class Awarded to players of a Clan, that achieved 3rd place in Operation Safari event.